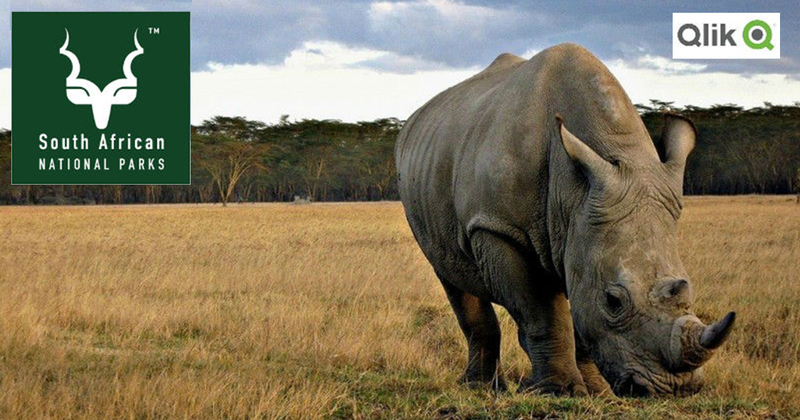 Learn how Qlik is working to prevent rhino poaching in South Africa. SANParks manages a system of parks which represents the indigenous fauna, flora, landscapes and associated cultural heritage of South Africa. Statistics on rhino poaching have been captured daily since 2000. Since 2008, rhino poaching has been on the increase, worldwide. Kruger National Park (KNP) in South Africa is roughly the size of Wales, or the state of New Jersey, and is home to over 8,000 rhinos. Unfortunately, this also means that poaching is concentrated in this area. The KNP is broken down into 22 sectors with assigned teams of rangers per sector. A massive amount of data on poaching incidents, incursions, arrests made, etc., is gathered daily. To combat poaching, RIC Consulting implemented a Qlik solution that allows for quick analysis of this data. The KNP uses this analysis to identify which areas were being targeted, which allows the rangers to deploy anti-poaching units more quickly and effectively. Qlik enables SANParks to effectively manage the resources & effort on the ground, day-to-day, and reallocate as and when required. Previously this was extremely difficult and almost impossible to achieve due to the amount of data being managed. The Qlik app allows users to make quick, informed decisions in a dynamic operational environment and not spend unnecessary time trying to analyze and present data. In 2016, a total of 662 rhino carcasses were found in the KNP, compared to 826 in 2015. This represents a reduction of 19.85% and helped draw praise from the Hon Edna Molewa, Minister of Environmental Affairs, who highlighted the progress on Integrated Strategic Management of Rhinoceros in South Africa earlier this year. Qlik’s CSR Program proudly supports global conservation efforts and encourages other organizations to look to Qlik and our partners like RIC Consulting for assistance with complex data analysis needs.